Today I had the immeasurable joy of celebrating Mother’s Day by passing along a Random Act of Kindness given to me. If you’ve been following my blog for a while, you know that I completed 40 random acts in celebration of my 40th birthday, then began a renewed purpose of blessing others in honor of the victims of the Sandy Hook Elementary shooting. My first act of kindness in this section was leaving smiley faced balloons in a local park, one of which was chosen by an autistic child and his dad. After visiting my blog and reading my story, the boy’s mom was so touched by this mission that she emailed me and donated a $25 gift card so I could in turn bless someone else. Ironically, and unbeknownst to us at the time, her son and my son attend the same daycare center. Occasionally I pass her as we are picking up our boys and I am always greeted with a radiating smile. A few weeks ago I told her I was saving her gift card for a special day – Mother’s Day – and she told me that was one of her MOST favorite holidays of all. How perfect! 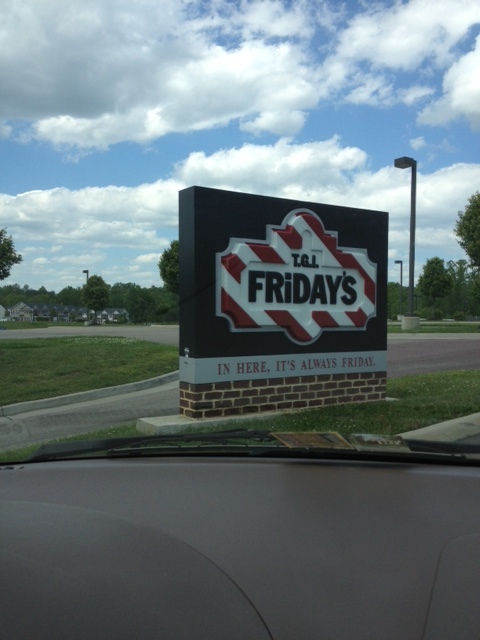 Today after visiting my own mother, I headed out to T.G.I.Friday’s. I wasn’t planning to stay and eat, I simply wanted to walk in and bless another mom. The waitress was inquisitive, so I explained my purpose and asked if she knew of any patrons who might benefit from a free dinner in celebration of Mother’s Day. She pointed to a corner table to my right which included a mom and her young daughter, finishing their meal. I walked to the table, introduced myself, and briefly explained my purpose as I slid the gift card across the table. She seemed surprised, but very appreciative of the unexpected gift. What a joy it was to bless a complete stranger in such a huge way on Mother’s Day! There was a moment, however, on my way back home where my joy turned a bit melancholy as I realized there are 26 moms out there whose hearts are breaking today, the first Mother’s Day without their treasured child. I simply cannot imagine the pain they are reliving today. This random act of kindness may not ease the ache in their souls, but it’s the least I can do to keep alive the memories of those lost. 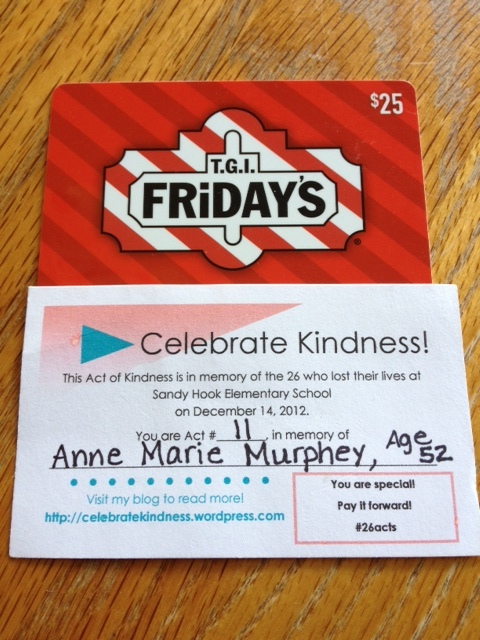 Today’s random act of kindness is dedicated to Anne Marie Murphey, age 52. Anne Marie was a special education teacher at Sandy Hook and was found that fateful day with her body wrapped around her student, trying everything in her power to shield him from the inevitable. Friends and family described her as very motherly, always showing her students love and kindness. I can close my eyes and almost imagine her wrapping her arms around all the tiny children who made their way into heaven that morning. Be blessed my friends. Take a moment to thank your mom. If you have children of your own, give them an extra squeeze tonight and cherish the small moments you share with them. We are not guaranteed a single day more here on this earth; treasure the time you have with those you love. 1 Response to "Random Act of Kindness #11 of #26acts – Happy Mother’s Day"
I am touched for so many reasons: 1- that my gift card made someone’s mother’s day extra special 2- Mother’s Day is my favorite holiday 3- the woman who your random act of kindness was dedicated to was a special education teacher since Eli has been blessed by so many special education teachers over the years! What a perfect way to honor Anne Marie Murphey! May her memory live on forever!